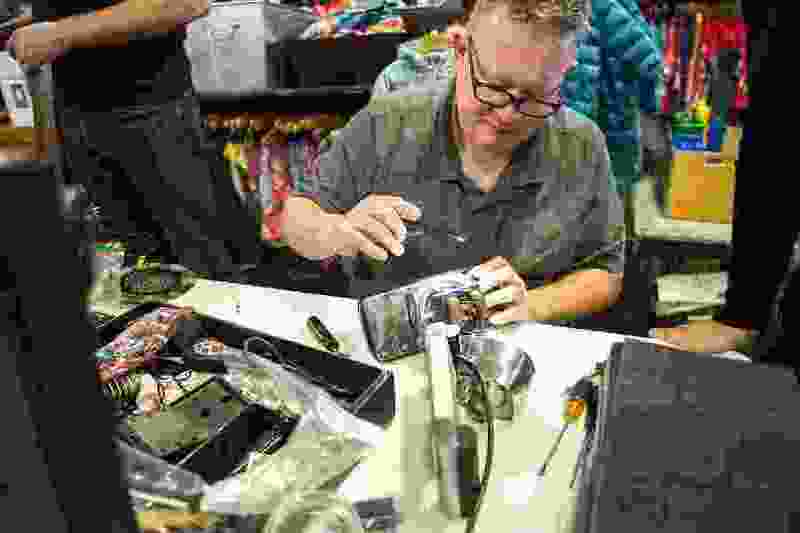 (Chris Detrick | The Salt Lake Tribune) Volunteer Dustin Caldwell works to fix a Jeanie Rub massager during the Utah Recycling Alliance's Fix it Clinic at Patagonia Outlet in Sugarhouse Saturday, January 27, 2018. While cleaning out his sister’s garage years ago, Jim Catano unearthed an electric Jeanie Rub massager that he has used regularly ever since — until his hair messed it up, that is. Strands of his ponytail went through a seam in the housing and jammed its motor. He began taking it apart in hopes of fixing a gadget that had become such an essential appliance. “I couldn’t figure out how to get it the rest of the way apart,” Catano said Saturday after bringing the massager to a Fix It clinic in Salt Lake City. His new Jeanie Rub, which he bought online for $100, doesn’t work as well as the broken one, which was manufactured back in 1985 with solid-steel construction. Utah Recycling Alliance, a Salt Lake City nonprofit promoting “zero waste” culture through a variety of programs and partnerships, holds Fix It clinics periodically to teach people how to avoid throwing things away by fixing them. “The response has been overwhelmingly positive. People want them in their communities,” Mary McIntyre, the alliance’s executive director, said while overseeing Saturday’s event at the Patagonia Outlet. The outdoor clothier is among her organization’s financial supporters. The clinics started last year at The Leonardo, where four more are scheduled this year, starting March 17. At Saturday’s clinics, people streamed in toting vintage furniture and appliances, like Catano’s massager, Agnes Greenhall’s Braun coffee maker and Sherelyn Sandberg’s Osterizer, an indestructible toggle-switch blender that appeared to suffer from a blown fuse. 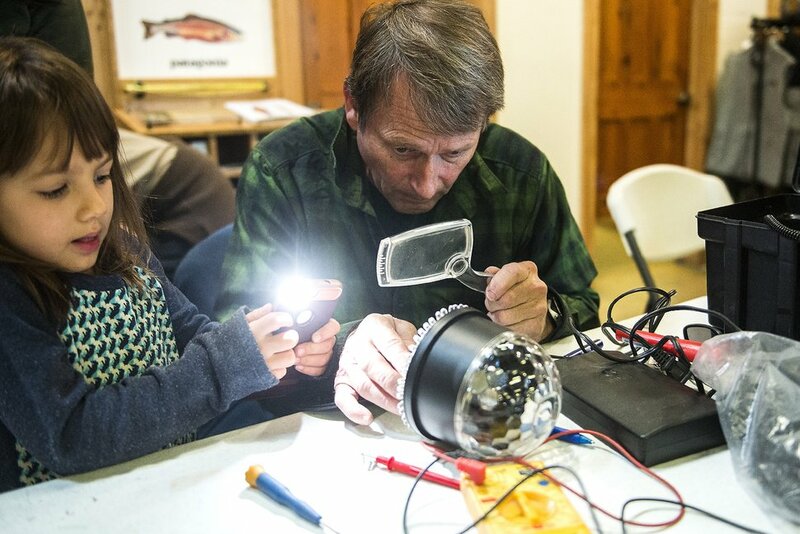 (Chris Detrick | The Salt Lake Tribune) Lila Shepard, 5, helps shine a light for volunteer Joe Mayernik as he works to fix her disco ball during the Utah Recycling Alliance's Fix it Clinic at Patagonia Outlet in Sugarhouse Saturday, January 27, 2018. The coffee maker’s malfunctioning switch presented a mystery to Fix It volunteer Joe Mayernik. “It heats up when this switch is on and it goes into a different position and shuts off. I see no loose wires,” said Mayernik, a Navy veteran who spent 14 years aboard submarines, where knowing how to fix everything was in the job description, along with unleashing nuclear strikes. Mayernik was the guy who supervised missile launches, should the need have arisen, but he still had to know where every valve and switch was aboard his vessel and how operate them. “If you were stuck in some compartment because of flooding, you might be the only guy trapped in there. You had to know how to work on everything,” he said. While recycling is in her organization’s name, McIntyre’s mission prioritizes reuse, which means fixing appliances, clothes and furniture when something goes wrong. Volunteer Dustin Caldwell, a chief technology officer for an Arizona company, carries tools inherited from his late father in an old valise. He also is armed with dozens of interchangeable bits and tools for working on modern electronic devices. These tiny tools, which fit into a compact kit called iFixit, resemble implements used in an operating room or a dentist’s office. Caldwell picked up one he called a “spudger” — part scalpel and part putty blade, and apparently good for prying casings apart or spreading caviar. Like everyone who participates in the Fix It clinics, Dan Lewis believes in reusing useful things and wants to share his carpentry skills to help others repair furniture, a household essential particularly prone to collapse, malfunction and aesthetic damage. “This is an area where knowledge is power. A little bit of knowledge can have a lot of value. Just a few basic principles,” said Lewis, a finish carpenter and furniture designer, as he was applying clamps to an upholstered chair. Joints, the source of most furniture failures, are easily repaired. “As glue ages, it changes. That’s what we fixed on this chair. A little bit of glue and some clamps and it gained several more years,” Lewis said. Meanwhile, Jim Catano’s massager continued to defy disassembly. In making the device look as seamless as possible, the manufacturer buried the fasteners, Caldwell speculated. But that padding, the part you put against your sore muscles, appeared to be secured with rivets. So while Jeanie Rub’s old massagers are superior to the new ones, perhaps they are a little too well made.